You have not seen such city in Minecraft Pocket Edition, its difference is not in architecture. The fact is that Caden is located on five different islands, while all parts are not connected though are at close distance from each other. This unique feature makes Caden a very interesting city for servers, since 5 islands can accommodate the majority of players. 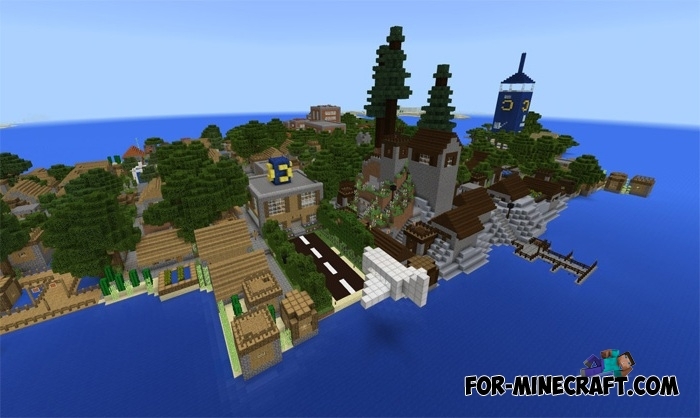 You will appear in the capital - the central island, its area is quite small as other islands. Some streets (not so many) are not completed yet, the islands will gradually increase and expand. For convenience, build bridges in those places where you want to quickly move to the other side without plunging into the water or craft a boat.